This report was originally drafted to stimulate discussion with Transition Cambridge Energy Group in May 2016. It has been updated to reflect points made by other members of the group. 1. What is Embodied Energy/Carbon? 2.1. Bottom up versus top down method. Embodied energy is the energy used to make something and embodied carbon is the carbon generated in the process. 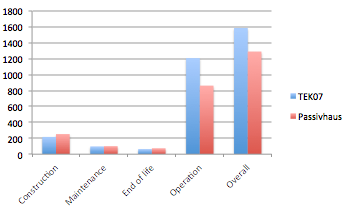 This is often compared to operational energy/carbon and the full 'cradle to grave' life cycle analysis (LCA) needs to include end of life processing as well. This chart describes LCA for a car. In the use phase the main energy use is the fuel to drive it, though there will be some involved in maintenance as well. At end of life some of the components are recycled and some are incinerated for energy - so you get some energy credit at the end, though not usually any carbon credit. Usually one or two phases dominate over the others. For example, for a conventional car (as we will see) the use phase dominates. For a house, both materials and use phase are important. For a carpet, the materials are important. For computer hardware the manufacturing and use stages are both important. Calculating embodied energy and carbon in stuff is horribly complicated. However, if you can get past that, by using reasonably assumptions, you will see the implications are quite important too. The basic methods for energy and carbon are the same, so in this section when I say carbon it means either energy or carbon, whichever you need. There are two main approaches. The bottom up approach means analysing carbon emissions from all the processes involved and everything they depend on e.g. This is very painstaking to do properly. In practice some of the processes involve relatively little carbon emissions so can be ignored but you cannot do that unless you have at least a good idea of which these are. For example you might decide you can ignore the infrastructure bit because each factory makes such a lot of stuff over its lifetime that the carbon emissions per item are very small. This approach tends to underestimate emissions because it is so difficult to include everything. The top down approach is more broad brush. For example, you might say the steel sector produces X tonnes steel per year and generated Y carbon emissions - hence the carbon emissions of steel is Y/X. In practice you have to be a bit cleverer than that because each sector takes inputs from other sectors and you have to count them too. The overall method is called input-output analysis and is normally based on prices rather than tonnes of material. For example suppose to make £100 of car you need to buy £30 of steel and you add value of £70. Then the total emissions of car output (carbon/£) is 0.3*carbon intensity of steel sector + 0.7* carbon intensity of the car sector. In practice there are a lot more sectors involved and you have to have a matrix describing the relationships. This method gives you a measure of carbon/£. For material goods you can translate that to carbon/tonne. However this method can be applied to services as well as materials. For example you could look at hotels, restaurants etc - any sector for which you have carbon emissions statistics. There are a whole lot of assumptions being made here. The input/output method assumes that a whole sector is homogeneous in how it makes stuff and how much carbon is generated per £ product. See Wikipedia for more. In practice you use a hybrid approach with enough detail for what you are doing. The input/output method is not refined enough to make serious comparisons (for example, to compare battery electric cars with petrol cars or plug in hybrids, see later) but it is obviously impossible to do a full bottom up analysis for everything. So in practice, most analyses involve a hybrid approach. For example the ICE database (only maintained up to 2011, sadly) has collected data from various sources to compile embodied energy and carbon per kg of material for a whole range of materials, from paper to steel, and different kinds of plastic. The source data for this may use the input/output method but it is generally used as part of a bottom up analysis. There are various other databases listing carbon emissions for different materials and processes but they are not free like the ICE. This is reasonable considering the cost of producing and maintaining them. If you are an academic you can probably get to them through your university. We talk about carbon emissions when we really mean greenhouse gas emissions. CO2 is not the only greenhouse gas and to make things simpler we tend to work in CO2e i.e. carbon dioxide equivalents. However it is hard to compare the impact of long lived gases like CO2 with the shorter lived gases. Consider methane. Its average lifetime Is 12 years and it gets oxidised to CO2 and water. While it is methane it is much more powerful than CO2. However, if you consider a long time scale (like 100 years) most of that time it is no worse than CO2 because it is CO2. Calculation of CO2e depends on the timescale. We usually use 100 years but arguably it should be shorter. Some scientists now recommend we do not even try to convert to CO2e and treat each greenhouse gas separately. Industrial processes for making things can result in many different types of greenhouse gas emissions. Methane leakage is a serious problem for the power industry but there are also important refrigerants and solvents that have high global warming potential. In many cases these additional emissions are leaks and ideally there should not be any - but in practice there always are. In some cases manufacturers can measure leaks simply by keeping track of their inventory. For example, they know how much they have to top up the solvent tanks and how much waste they have collected so the difference has leaked (into the atmosphere). However, it is clearly impractical to measure nitrous oxide emissions from manure, or from the soil after application of fertilisers. In practice the best you can do is to estimate these as a proportion of the amount of protein in feed and the amount of nitrogen in fertilisers applied. Hopefully most of the protein in feed goes into the animal itself and most of the fertilisers applied go into the plants being grown. In practice this rather depends on the health of the animal, the weather, the type of soil and other factors. Some companies report environmental accounts. To help UK companies, DEFRA provides a list of carbon factors that you can use - for example carbon/kWh of electricity and other fuels, carbon/tonne-km for freight, carbon/km for cars and carbon/person-km for travel by bus, train, plane etc. They also have a small list of factors for material goods in carbon/tonne. For example you have factors for paper, books, clothes (e.g. uniforms), food and drink and so on. Electrical items are categorised into fridges and freezers; small medium and large WEEE; and batteries. These factors are obviously very rough and only work for large quantities. Carrots, lettuce and beef do not have the same carbon emissions per kg but it is not utterly ridiculous to use a single figure for all food and drink if you consider, say, a company canteen over a year. On the other hand if you want to estimate savings from making your canteen vegetarian you need more detail than this. For some materials recycling has huge benefits in energy savings, and hence carbon savings. Data from the ICE (3). This adds another complicating factor to the embodied energy calculations, as you have to make some assumptions about how much of the material is recycled. Usually one would use a market average recycling rate for the material. However, this changes over time, depending on government and company policy and consumer behaviour. The manufacturer can influence the recycling rate by implementing a buyback scheme of some kind or by making a big effort to source recycled materials. It seems reasonable to give them credit when they do this by using the actual recycling rate, as long as they have evidence for it. Do we grow sheep for wool or for meat? Historically wool was the main product and meat was a by-product but now it is the other way around. So what are the carbon emissions from growing wool? There are lots of other difficult cases. For example, what are the carbon emissions from biomass pellets if you make them from thinnings and offcuts rather than whole trees? What are the carbon emissions from animal feed produced from spent barley from beer making? The problem is how to allocate the impacts from a complex process with several products. There are two methods commonly used. The simplest approach is to allocate the products by their economic value. So if a forest produces £450 worth of timber for every £50 worth of biomass chips that are made into pellets, then 10% of the total value is biomass so 10% of the carbon emissions from producing the trees is allocated to the pellets. This method is simple but can change over time - as in the sheep for wool/meat case. An alternative approach is avoided burdens. Consider the animal feed case. You can argue that if you did not have the spent barley it would be necessary to grow feed instead and that would also involve carbon emissions. Using the spent barley as a by-product therefore has negative emissions. However, this only works if you assume that you would have produced the animals anyway so you definitely need the feed. Consider the beer and animal feed case. Here are some figures just for illustration - they are probably not realistic. Case 500g CO2 emissions in total from producing 1 pt beer plus some animal feed. Ultimately we are concerned about carbon emissions but, at least for the time being, energy use directly causes carbon emissions. This difficult is how to know exactly how much carbon is generated, because it depends on the sort of energy and where it has come from. This is especially a problem for electricity. For example, electricity in the UK is currently about 460g/kWh on average but in Norway it is more like 2g/kWh because most of their energy is from hydroelectricity. This means that goods (such as paper) manufactured in Norway using electricity have lower carbon emissions than goods made in the UK. Unfortunately we cannot simply transfer all the worlds manufacturing to low carbon areas like Norway and Iceland because there are limits to how much energy they can provide. So on that basis, you could argue we should use global averages for all energy use. (But nobody does). The car case study later on uses an average for Europe. Electricity in the UK is about 460g/kWh on average at the moment but it varies from year to year and will decrease substantially as we decarbonise the supply. This does not affect calculations of embodied carbon, assuming we make the stuff now. It does affect calculations of operational carbon for the future. The heat pump solution has lower emissions than the gas boiler, when you consider the whole lifetime of the system. However, not knowing the future it is hard to know how much better it will be. The car case study below makes various assumptions about the future that are very uncertain. About half the carbon emissions from cement manufacture are chemical, not energy use. Also, some industrial processes generate carbon emissions chemically, not just from using energy. Cement manufacture is a classic example. About half the emissions from manufacturing cement is chemical rather than energy use (see Wikipedia ). There are also process emissions of CO2 from producing iron and steel and from various chemical processes. Timber is increasingly used as a building material, in various forms. Houses are usually designed to last at least 50 years. So, arguably, using timber construction is a way of storing carbon. This is carbon that was absorbed from the atmosphere while the trees were growing. If the forest is managed sustainably, there will be new trees now growing so absorbing more carbon. However 50 years is not forever and what will happen to wood then. Some environmental impacts databases count use of wood as negative carbon emissions, others do not. 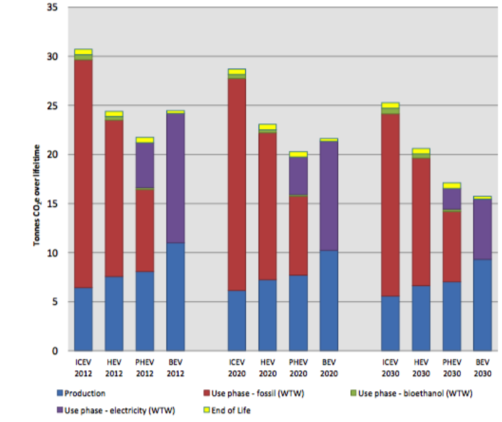 This report compares carbon emissions from 4 types of car (petrol, hybrid, plug in hybrid and battery EV) in 2012 and with predictions for how this might develop in 2020 and 2030. This chart summarises the results of the analysis. Each bar represents total lifetime CO2e for the car, based on 150,000 km driven. The petrol car has the most impact from the use phase but the battery car has the highest embodied emissions. For the petrol car, use phase is nearly 80% but for the battery car it is only about half. In 2012 the plug in hybrid is the lowest overall emissions because it has a smaller battery. However by 2030 the battery car is best because it is predicted that electriicty will be much cleaner than now. They gathered data on the material components of each car: how much steel, aluminium, copper (wiring) platinum (catalytic converters), glass, various kinds of plastic - about 40 kinds of material in all - is needed to make each type of car. They used carbon factors for each material to get the total for the materials. They added 1.4 t CO2 for assembly, based on data for how much energy is used to make an average car (gas/coal, electricity, district heating) and the average carbon factors for these types of energy for Europe. 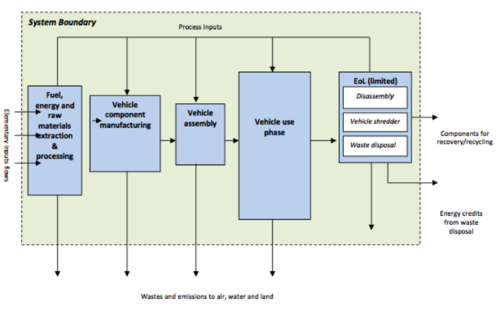 For the use phase, they took vehicle efficiency from the standard driving cycle test and applied factors for petrol, bioethanol, and electricity. The carbon factors used here were for the UK specifically. For end of life they assumed EU targets for recycling were met so they also take account of carbon emissions from the shredding process and from waste incineration of some of the materials. The specifications of the example cars are given, and the quantities of each material needed to make them are estimated. The energy used in assembly is the same for all four. They assume that the lifetime is 150,000km and the fuel efficiency is as measured on the test. Varying these will make a big difference to the carbon emissions from the use phase. Carbon emissions from maintenance during the vehicle lifetime are ignored but this is probably reasonable. Savings from recycling important parts of the car like the battery and precious metals in the catalytic converter are ignored. In fact they do a sensitivity analysis to see what difference recycling could make. The main difference is due to the battery in the battery electric vehicle. Assuming 75% savings from recycling the battery this reduces the overall lifetime emissions of the battery car by about 13% (3.4 tonnes CO2). Improvements in technology reduces embodied emissions of batteries. All of these guesses are very uncertain so the analyses for 2020 and 2030 are debatable. I have been look asked to at the embodied energy (or possibly carbon) of insulation and hence the payback time based on heating energy savings. The ICE is not very good on insulation materials but I found reasonably comprehensive data from Greenspec . The table below compares data for various kinds of insulation and my calculated energy payback time and savings over 20 years. The payback time in energy in all cases is less than 1 year and over 20 years it hardly makes any difference which you have used. I assumed 100mm thickness in all cases except for the PIR/PUR case. That is enough to reduce the wall U value from 1.6 down to between 0.28 and .31 which gives heat savings of 90 to 95 kWh/year/m2 based on an average room temperature of 19°C. In the worst case, if the embodied energy is electricty and heating energy is gas, so just 1/3 the carbon, the payback is still less no worse than 2 years. Increasing the thickness of the PIR/PUR insulation to 100mm increases savings but also increases the embodied energy. Overall the payback time increases to 1 year but the savings over 20 years increase to 1890 kWh. Here is the detail on the calculations, using EPS as an example. There is nothing in builidng regulations about embodied energy or carbon emissions for any sort of building. The EU 'Nearly zero-energy buildings' standard only refers only to operational energy, specifically that used for heating, cooling and domestic hot water. It ignores appliances such as TVs and washing machines. BREEAM (Building Research Establishment Environmental Assessment Method) is a widely used and respected standard for environmental impact of building designs. If you want to be seen to be environmentally responsible, you can specify that your new building is BREEAM rated Excellent or Outstanding. There are 10 categories of environmental impact considered; energy and materials are only part. However, you can get points in BREEAM for using materials that have low embodied impact and that have been procured sustainably. For example BREEAM considers wood to be very good and you get points for using it. Thatch is another way to incorporate low carbon natural materials into a building. The Enterprise Centre at UEA has been built with thatch cladding for the walls. The cladding units are pre-fabricated as cassettes for easy on-site installation. Traditional buildings styles using masonry, concrete and/or steel frame have high embodied energy whereas natural materials are usually much lower in energy. FACIT-Homes sell timber frame 'precision engineered' buildings that are designed to be low energy. They published a study comparing FACIT homes with a traditional masonry structure (4). (Bear in mind this is not peer reviewed). 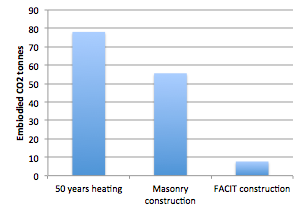 For example,the table below shows their assessment of masonry vs. FACIT walls and roofs. The chart below shows a comparison of embodied carbon versus operational carbon for the FACIT home and masonry home, assuming typical heating requirements for UK building regulations for 50 years. For the masonry home embodied carbon is less than operational carbon but still significant. For the FACIT construction the embodied carbon is not important. Embodied carbon data from (4). Assumes gas heating. Passivhaus standards have higher embodied energy but this pays back quickly. In this study, overall life cycle emissions for the Passivhaus was 19% lower than the TEK07 standard home even though construction phase emissions were about 15% higher. Operational emissions dominate in both cases. Carbon emissions comparison for a Passivhaus with a Norwegian standard (TEK07) house by life cycle stage. Operation dominates. Data from (5). Heating for both homes was from electricity. The carbon factor used for electricity is 190g/kWh - less than half the UK average, about the same as UK natural gas. (5) Life cycle assessment of a single family residence built to Passivhaus Standard Oddbjorn Dahlstrom, Norwegian University of Science and Technology.